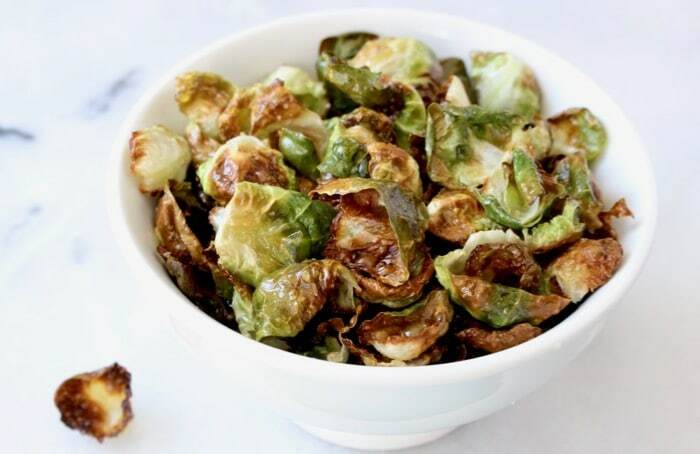 Crispy baked Brussel Sprout Chips with just a drizzle of olive oil and a pinch of sea salt. 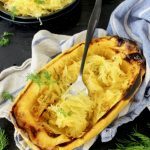 Healthy, paleo, vegan, easy to make and loved by all! I have found a whole new love for Brussel sprouts you guys, and tough I’ve made these chips 3 times last week, I can honestly say I just couldn’t keep up with the demand. So you can forget about finding a way to store them, because those babies won’t even get a chance to cool off completely. They were literally gone as soon as they came out of the oven, so prepare yourself to make a few batches of them. 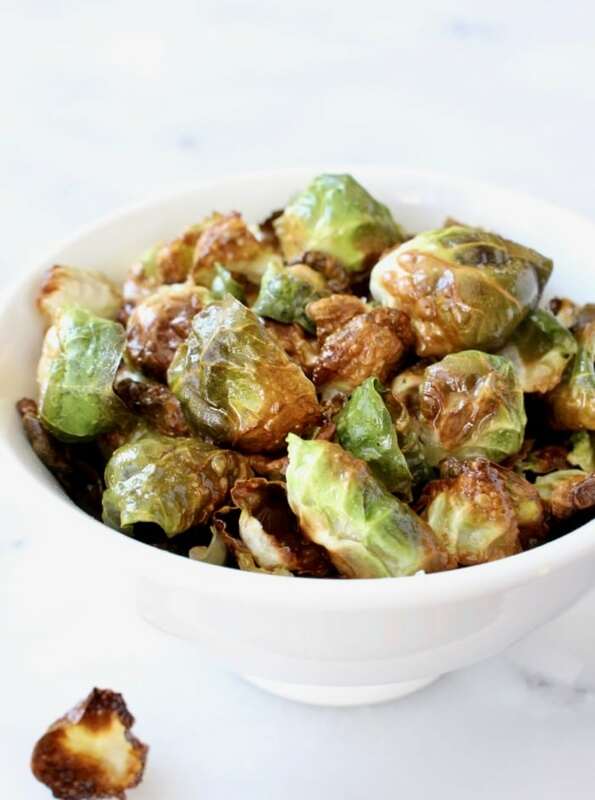 The best way to make crispy Brussel sprout chips is to bake them! Why ? Because you will get extra light chips that are good for you, with literally just a touch of olive oil and sea salt. 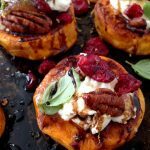 So if you are looking for a healthy way to cook them, baking is your best friend. I won’t lie you guys, you will need to dedicate some time to peeling the outer leaves from the sprouts. I say about 20 minutes or so, but you can do this a day in advance and store them in a bowl in the refrigerator covered with plastic wrap. Very important to not over salt them! Wait till they come out of the oven and taste them before sprinkling any extra sea salt on top. 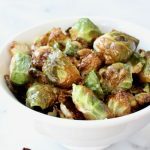 Crispy and light baked Brussel Sprout Chips with just a drizzle of olive oil and a pinch of sea salt, quick, easy and good for you! Gently peel the outer leaves of the brussel sprouts without tearing them. Reserve the center of the sprouts for other uses. Drizzle a tiny bit of olive oil on top of a large cookie sheet. Sprinkle with a small pinch of sea salt and pepper flakes. 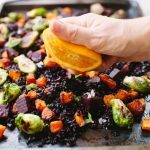 Place the brussel leaves on top cookie sheet and using your hands gently toss them to coat in the olive oil very lightly. Spread them around preferably without touching each other or overlapping. Bake them in the preheated oven for about 5 to 8 minutes until they start turning golden brown. Check often making sure not to burn them. Shake the cookie sheet once or twice midway. 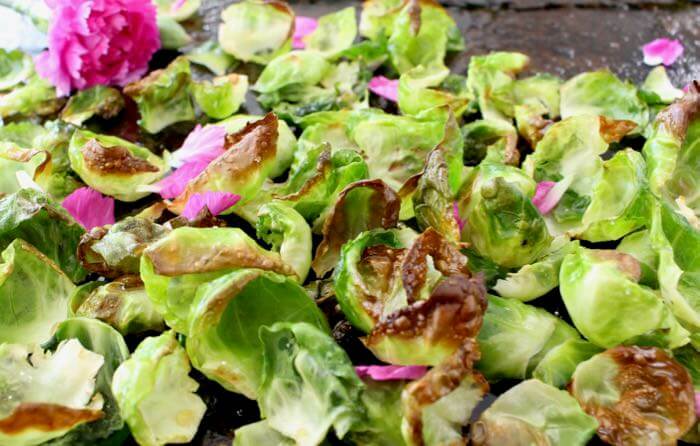 Serve the Brussel sprout chips hot with grated parmesan cheese on top or a squeeze of lemon juice. 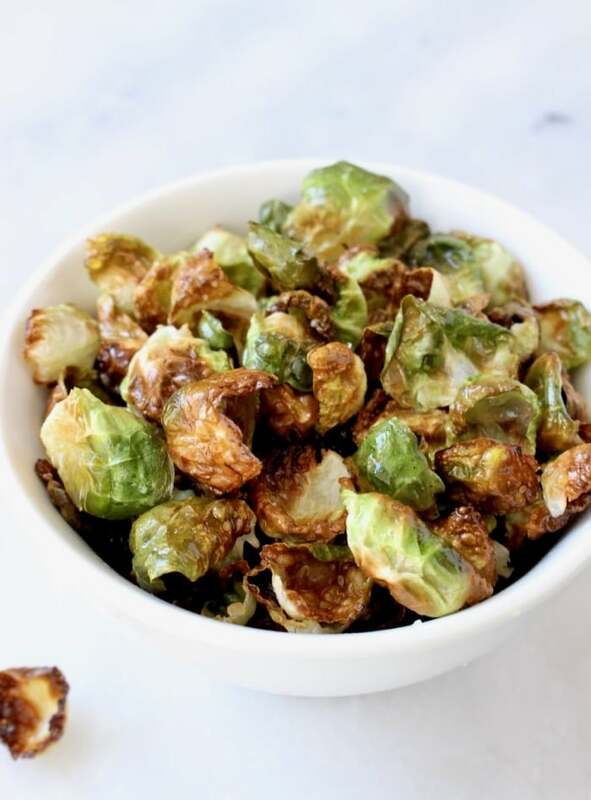 Crispy Brussel Sprout Chips Recipe Video! Those are the prettiest brussels sprouts that I’ve ever seen! They look and sound tasty, as well. awww thank you, you know just Brussel sprouts doing their thing! Wow what a unique and healthy idea!!! Gosh, what a fantastic idea! 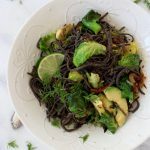 We go love Brussels sprouts in this house – what a great way to eat them! My hubby is a big fan of brussel sprouts. I buy them almost every week. great idea about the chips. 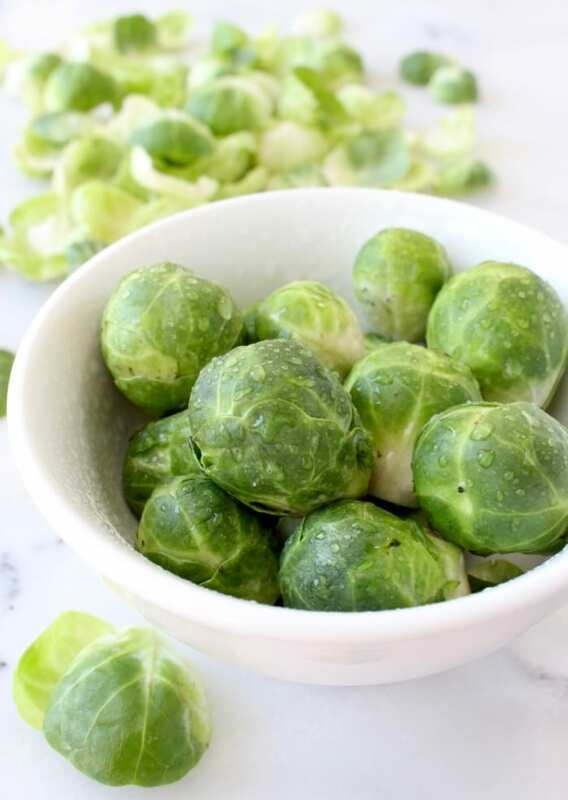 I love love love Brussels Sprouts! The crispier the better! You can bet I’ll be making these for our next Super Bowl Party! 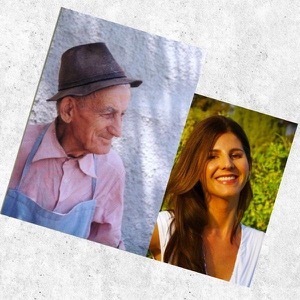 Lightbulb moment! 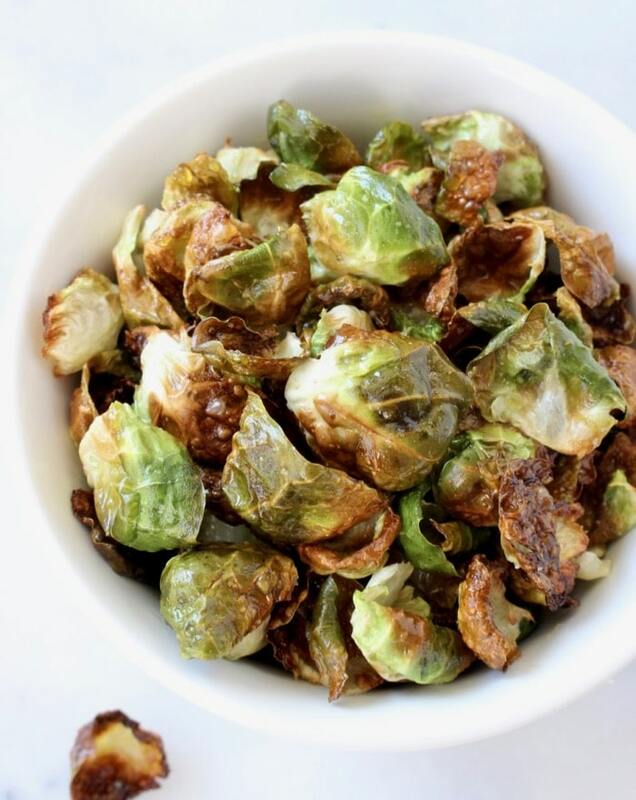 Heck yeah, Brussel sprout chips will be a thing at my next Super Bowl Party too! Duhhhh! Perfectly crispy If you work in batches, absolutely worth having a little patience. Will make again and I hope to find the sprout leaves in the fall at the market to cut down on prep time. Otherwise prep in advance if making this for more than a couple of people. Otherwise amazing easy recipe.